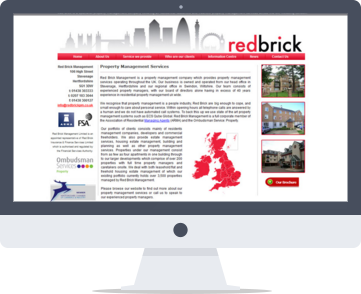 RedbrickPM are a nationwide property management company. We successfully designed a unique website which showcases their services throughout the UK. Alongside this we have worked on an ongoing SEO campaign since October 2010. RedbrickPM are a nationwide property management company. We successfully designed a unique website which showcases their services throughout the UK. Alongside this we have worked on an ongoing SEO campaign since October 2010. They are now on the top rankings of Google.co.uk for many searches, such as ‘Property Management Companies’. This has meant they could expand and grow their company exponentially and have now opened a new office to accommodate for the extra work. Before we launched the SEO campaign their website received 200 visitors per month but, now receives well over 3,000 unique visitors per month.